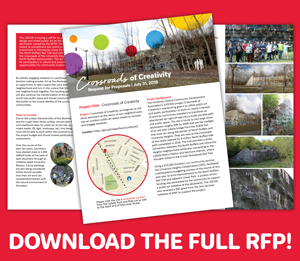 The University District Community Development Association’s (UDCDA) project Crossroads of Creativity’s overarching goal is to utilize public art and public participation to build on nearly a decade of work by community members to transform an abandoned rail right-of-way into a multi-use bike path and public space. 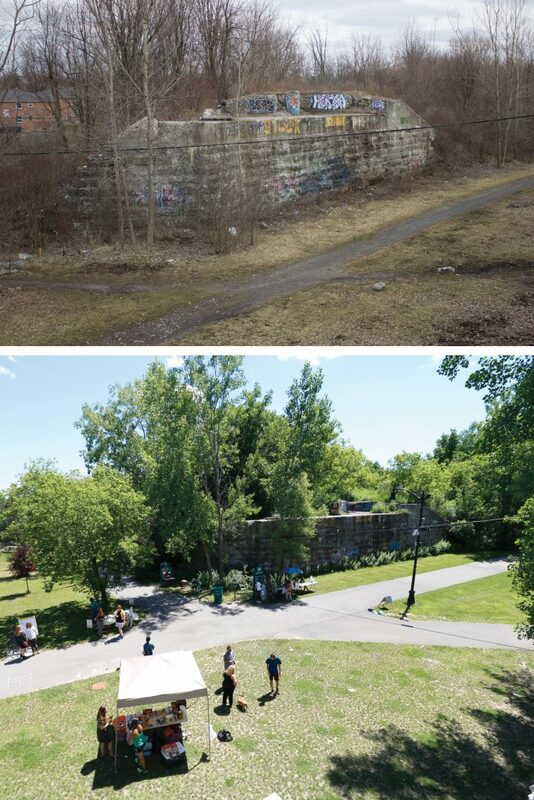 The site is home to two large stone abutments roughly 20ft by 100ft that are the vestiges of an old train trestle bridge from the DL&W Rail that once ran along the border of North Buffalo and University Heights. They are now at the crossroads of the newly opened $1.4 million North Buffalo bike path completed in 2016. The trail provides a direct connection between the North Buffalo and University Heights neighborhood while also connecting to the LaSalle Metro Station and Kenmore Avenue, where the path linked to the 4-mile Tonawanda Rail Trail. Using a large donation, our community partner, the University Heights Collaborative (UHC), facilitated a participatory budgeting process over the course of this past year to fund improvements to the North Buffalo Rail Trail and adjacent Linear Park. A portion of this funding was earmarked by the community to support a public art initiative at the abutments. The UDCDA also received a DEC grant from the Arts Services Initiative of WNY to support the project. The UDCDA is issuing a call for artists to design and install public art on the eastern abutment, owned by the NFTA. The art is meant to compliment the recent public investment in Minnesota Linear Park and the North Buffalo Rail Trail and celebrate the crossroads of the University Heights and North Buffalo communities. The art should be participatory in nature and provide opportunities for community involvement. A stipend of $4,000 will be paid to the winning artist(s) and the project should be completed by late fall 2018. The Crossroads continues to evolve as a public space and community gathering spot. Seen here is the transformation from 2015 to present.